I'm the exact same. There's nothing wrong with down time. 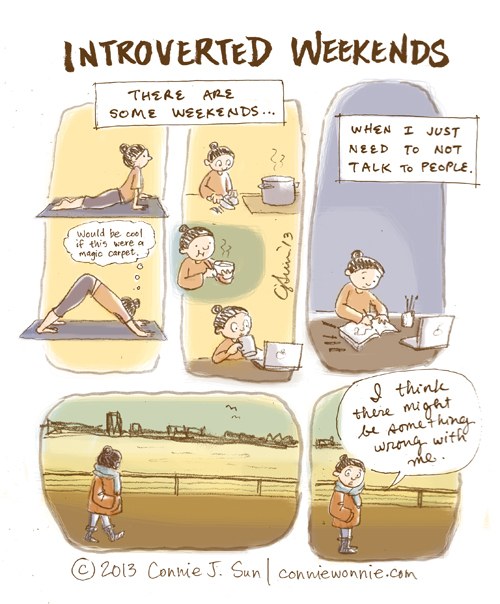 :] I'd say we introverts have it better with all that self-reflection and potential for growth! There is a lot of beauty in the state you describe. It reminds me of Chungking Express or 2046. Anyway, there's nothing wrong with you, just remember to focus on your breathing on your flying carpet! I spend every weekend just like you. I think if you never feel the need to take one step back and just be comfortable being with yourself, then there's something wrong with you. With a husband and two kids, I would pay a lot to have a quiet weekend to myself for once. I love them to bits, but I miss alone time! Anonymous #3 again: By the way Connie, does it annoy you to get strange advice-comments for your posts? It's a human reaction to try to solve other peoples problems, but if you were looking for advice I guess you'd find better ways instead of drawing those lovely cartoons. Thanks, all, for leaving me nice blogger mail.